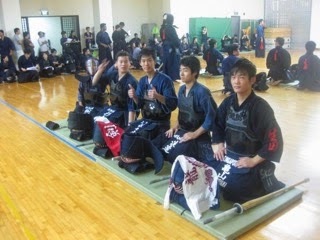 Singapore Kendo Club News: Bon Voyage, Sughiyama Shigheca! The following passage was written by Kenta Sasaki Lo. He was invited to write a short farewell message to his sempai in Kendo, Sughiyama Shigheca, a friend of his ever since he started Kendo with the Singapore Kendo Club. 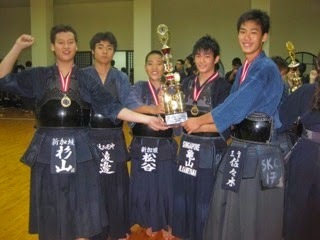 I joined the Singapore Kendo Club in April 2007 when I was 14. It has been 8 years and one of the first friends I made then was Sughiyama. He was pretty small back then and younger than me, well… I was small then too. However despite him being smaller than me, I saw him as a figure larger than me, and I looked up to him. During the hard times as a beginner he looked out for me, taught me some basics, fooled around with the other Japanese kids after training - those were the best memories I have with him. I’ll always remember the day when he was beaten to a pulp by Tsue sensei but he refused to yield. He kept getting up and charging right back at him even as he cried under his men, that was the moment when I thought, I want to be strong just like him… No, I will surpass him someday. I thought of him as a friend and also as a rival. We pushed each other’s limits and tested our skills against each other. In 2010, we entered the Youth Tournament together with our other Japanese friends. Our team was made up of the following members, Matsutani Yoshinori, Sughiyama Shigheca, Watanabe Koutarou, Kameyama Naoto and me. We won that particular year and it was our first win together. The joy we all shared then will always remain in our hearts. It's a shame he has to leave after so many years of fond memories and training together. There are definitely mixed emotions but nevertheless, I wish him the best in his future endeavours and I’m sure he will continue to do his best for both his studies and Kendo. I’m sure we will meet again in the future as we practice the way of the sword.